Rosemary and slow-cooked onion yield a savory-sweet base for Chicken Paprikash. For a tangy finish, Minnesota chef Amy Thielen stirs a shot of fermented-pickle brine into the sauce. The recipe comes from Amy's book The New Midwestern Table (clarksonpotter.com). Heat a large, deep skillet or Dutch oven over medium-high heat and add the oil. Season the chicken with salt and pepper. Working in batches, cook chicken in hot oil until browned, about 4 minutes per side. Set all chicken pieces aside in a bowl. Remove all but about 1 tablespoon of the cooking fat from the skillet. Add the butter, onion and sweet pepper. Season with salt and pepper, then cook over medium heat, stirring, until vegetables are soft and very tender, about 20 minutes. Add the garlic, tomato paste, rosemary, marjoram and paprika; cook for 1 minute. Remove skillet from heat. Add the wine. Return skillet to the heat and stir, using a wooden spoon to remove any bits that are stuck to the bottom of the skillet. Add the stock, lemon zest, vinegar and more salt and pepper to taste. Nestle the dark meat pieces in the liquid and bring to a simmer. Reduce the heat to medium-low and simmer, partially covered, for 40 minutes, turning chicken occasionally. 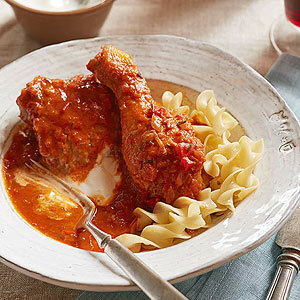 Add the white meat pieces and any residual juices in the bowl to the skillet, and cook, partially covered, at the same slow simmer for about 25 to 30 minutes or until chicken is no longer pink (170 degrees for breast, 180 degrees for thighs and drumsticks). Meanwhile, make the sour cream topping: In a small bowl, stir together the sour cream, lemon juice, and salt and pepper to taste. Chill until ready to serve. Transfer chicken pieces to a wide bowl or plate. Remove half the pepper-onion sauce and puree in a food processor or blender. (Or use an immersion blender to blend about half the sauce in the pan.) Return pureed sauce to the skillet, along with the chicken and the pickle juice, if using. Taste for seasoning, then warm the chicken in the sauce for about a minute before serving with sour cream topping.